Series 453 incorporates the basic Double-Hung residential sashes into bold square commercial framing with dedicated head, sill and jamb adaptors. A popular choice in both residential and commercial building applications. Some of the practical features of these windows are that they do not protrude over decks or walkways and are a superb window for ventilation. Flyscreens tuck into dedicated recess in the jamb inlay adaptor, supported with concealed nylon clips. Custom heavy duty key lockable catch with die cast keeper. 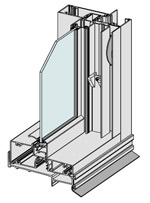 Sashes will accept glass up to 6.76mm thick. Standard 30mm nailing fin jamb as illustrated right or alternative 44mm wide jamb. Matching horizontal sliding sashes into commercial framing, refer Series 452. For a higher performing heavy duty double-hung window, refer Series 463. Dedicated 90° and 135° couplers.